Habit: Shrub 30--100 cm. Stem: young stems glabrous, glaucous. Leaf: +- thin; distal cauline leaves 30--90 mm, widely triangular-ovate, +- serrate, bases fused around stem; distal leaf pairs +- disk-like. Inflorescence: generally glandular. Flower: calyx 3.5--7.5 mm, lobes ovate; corolla (17)20--25 mm, gradually expanded to throat, (5)6--9 mm wide when pressed, red-pink, strongly lined, glandular outside and inside (floor lacks nonglandular hairs); anther sacs 1.1--1.3 mm, spreading flat; staminode included, glabrous. Chromosomes: 2n=16. 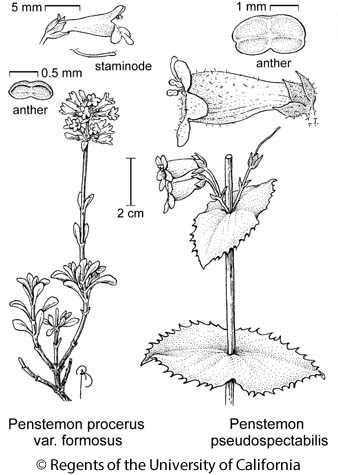 Citation for this treatment: Margriet Wetherwax & Noel H. Holmgren 2012, Penstemon pseudospectabilis, in Jepson Flora Project (eds.) Jepson eFlora, http://ucjeps.berkeley.edu/eflora/eflora_display.php?tid=37063, accessed on April 19, 2019.